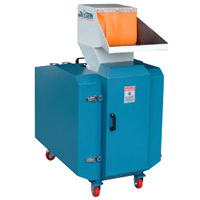 Plastic Granulator - Soundproof Crusher(JA Series) - Sinchung(Jachen) Technology Co., Ltd. The Granulators are used to crush the waste products from plastic injection molding machine. Double layers noise-resistant of hopper installation can reduce noise.